There have been two national British Thoracic Society (BTS) bronchiectasis audits from 1 October to 30 November in 2010 and 2011 in patients with non-cystic fibrosis attending secondary care. The first audit was soon after the publication of the BTS guidelines in July 2010 and both audits were based on the BTS guideline recommendations. We had 1460 and 2404 records in the 2 years respectively. The national audits highlight that the majority of guideline recommendations were not currently being adhered to and demonstrate the need for national quality standards, which are currently in preparation. There have been two national British Thoracic Society (BTS) bronchiectasis audits from 1 October to 30 November in 2010 and 2011 in patients with bronchiectasis attending secondary care. The first audit was soon after the publication of the BTS bronchiectasis guideline in July 2010 and both audits were based on key recommendations from the BTS guideline for non-CF bronchiectasis.1 A total of 1460 and 2404 records were submitted from 59 and 93 institutions in the 2 years respectively. The audit results for 2010 and 2011 were very similar. In keeping with international studies the majority of patients were women (61–62%) and the mean age was (64–66 years). From the sputum microbiology in the last year, Pseudomonas aeruginosa was isolated in 21% of patients in the 2010 audit. In the 2011 audit P aeruginosa, methicillin-resistant Staphylococcus aureus (MRSA) or enteric gram-negative organisms (if isolated on two or more occasions, eg, Escherichia coli) were isolated in 26% of patients. In the group with P aeruginosa or enteric gram-negative organisms, 18% were resistant to ciprofloxacin and 9% to gentamicin (see figure 1). Snapshot of microbiology and antibiotic treatments given. In 2010, 21% had Pseudomonas aeruginosa (PA) but do not have the combined data for methicillin-resistant Staphylococcus aureus (MRSA) and enteric gram-negative organisms. IV, intravenous; LT, long term. The mean (SD) number of exacerbations was 2.6 (2.5) for both audits. This was lower than expected in a cohort attending secondary care and with 21–26% of patients infected with P aeruginosa, MRSA or enteric gram-negative organisms, groups that would be expected to have multiple exacerbations per year. The accuracy is not known as data were not crosschecked with primary or secondary care records. A total of 16–17% had received intravenous antibiotics in the past year, 27–33% used long-term (>28 days) oral antibiotics and 9–10% used nebulised antibiotics (76% nebulised colomycin, 12–13% gentamicin and 5–6% tobramycin; 6% used other agents not specified, see figure 1). As part of the audits, we requested information on current treatment patients were receiving for chronic management of their bronchiectasis. We asked about use of inhaled corticosteroids, short-acting and long-acting bronchodilators, agents that improve mucociliary clearance and long-term antibiotics. A total of 78–81% were on inhaled corticosteroids with a mean dose of 1094–1252 μg/day. This is despite the guidelines not recommending the long-term use of inhaled steroids unless there is clear clinical benefit or in those with coexistent asthma or COPD. The audit did not provide any data on these. Regarding bronchodilators, 66–67% were on a short-acting β2 agonist and 9–11% were on a short-acting anticholinergic; 62–65% were on a long-acting β2 agonist and 29–30% were on a long-acting anticholinergic. For agents that improve mucociliary clearance 27–30% used carbocysteine, 6–8% used nebulised saline (of these, 37–38% used 0.9% saline and the remainder used higher concentrations varying from 3% to 7%), 0–0.4% used inhaled mannitol and 0–0.2% used nebulised DNAase. 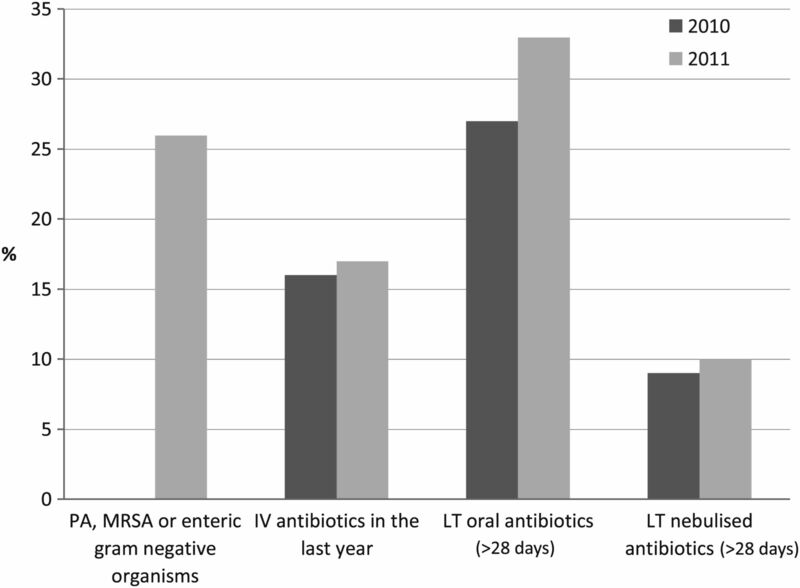 Regarding long-term antibiotics, 27–33% used long-term (>28 days) oral antibiotics and 9–10% used nebulised antibiotics (76% nebulised colomycin, 12–13% gentamicin, 5–6% tobramycin; 6% used other agents not specified). These treatments may have all been influenced if patients had coexistent asthma, COPD or other comorbid illness and the audit has no information about this. In clinical practice, however, many clinicians use a variety of treatments despite a lack of evidence base to support these. Trials to improve the evidence base will guide clinicians on the optimum therapy for their patients. There were seven recommendations drawn from the initial bronchiectasis guidelines 1 and the audits were designed to assess whether there was adherence to these recommendations. Recommendation 1 is that 90% of patients diagnosed with bronchiectasis should have had the diagnosis confirmed with a chest CT scan. In the audits, 93% were diagnosed with a CT scan of the chest, 1% by bronchogram, 2–3% had a clinical diagnosis only and for 3–4% there were no data. The first recommendation was met. Recommendation 2 is that 90% of patients diagnosed with bronchiectasis should see a respiratory physiotherapist so patients are taught chest clearance techniques. In the audits, 65–69% said their patient had seen a respiratory physiotherapist, 18–23% said they had not and in 12–14% there were no data. The second recommendation was not met which is in keeping with clinical experience that not all patients with bronchiectasis have seen a respiratory physiotherapist to be taught chest clearance techniques. Recommendation 3 is that all patients being seen should have a record of cough, sputum purulence, estimated or measured 24 h sputum volume and breathlessness when clinically stable. In the audits, 70–73% had a record of cough, 66–68% sputum colour, 49–54% 24 h sputum volume and 55–62% breathlessness. The third recommendation was not met. Most patients with significant bronchiectasis have these symptoms. Estimating their severity will allow consistent assessment to help the ongoing management of such patients. Recommendation 4 is that all patients diagnosed with bronchiectasis should have immunoglobulins and protein electrophoresis checked along with total IgE, IgE to Aspergillus or skin prick testing to Aspergillus, and for those aged <40 years, tests to exclude CF. In the audits, 73–77% of patients had their immunoglobulins checked and 58–60% had serum sent for protein electrophoresis. Although protein electrophoresis is advocated in the guidelines in addition to measurement of immunoglobulins, the additive value of protein electrophoresis needs to be explored as the primary aim is to identify immunodeficiency. A total of 62–75% had IgE measured and 53–54% had A fumigates radioallergosorbent test or skin prick testing to Aspergillus. The combination of total IgE and IgE to Aspergillus or skin prick testing to Aspergillus is advocated as the results vary depending on the activity of Aspergillus hypersensitivity. For those aged <40, 30–33% had CF gene analysis and 46% had a sweat test carried out. The fourth recommendation was not met. These are recommended investigations for secondary care as the long-term management may differ if an immunodeficiency, allergic bronchopulmonary aspergillosis or CF is identified. Recommendation 5 is that all children who are old enough (usually age over 5 years) and adults should have measures of forced expiratory volume in 1 s (FEV1), forced vital capacity (FVC) and peak expiratory flow (PEF) in primary and secondary care. Repeat assessment of FEV1, FVC and PEF should be made at least annually in patients attending secondary care. FEV1 and FVC should be measured before and after intravenous antibiotic therapy as this may give objective evidence of improvement. Spirometry should be measured in all patients before and after commencing long-term oral or nebulised antibiotic therapy. In the audits, 30% had PEF measured and 55–60% had spirometry measured on the day of consultation. For patients who received intravenous antibiotics, 22% had spirometry assessed before and after a course of intravenous antibiotics, 56% did not have this assessment and for 22% there were no data. Of those receiving nebulised antibiotics, 61–63% had spirometry checked at the start of treatment and later on during the course of treatment, 13–20% did not have these checks and for 17–26% there were no data. Of those taking nebulised antibiotics, 82–83% had spirometry checked at least 6 monthly. The fifth recommendation was not met. Spirometry may be useful to monitor disease progression and response to treatments. Recommendation 6 is that 90% of patients with an exacerbation should have a sputum sample sent for bacteriology culture prior to empirical antibiotic treatment. In the audits, 55–57% had a sputum sample sent for bacteriology culture, 33%–42% did not and for 3–10% there were no data. The sixth recommendation was not met. Monitoring sputum microbiology is key to providing appropriate antimicrobial prescribing. Recommendation 7 is that pulmonary rehabilitation should be offered to individuals who have Medical Research Council grade 3 or worse breathlessness affecting their activities of daily living. In the audits, 12–15% had been referred, 13–17% had not been referred, 5% were unable to participate in pulmonary rehabilitation, 52–54% did not meet the criteria for pulmonary rehabilitation and for 13–16% there were no data. The seventh recommendation was not met. Pulmonary rehabilitation in such patients has the potential to improve their exercise capacity and general wellbeing. This national audit over a 2-year period has provided a snapshot of how bronchiectasis is managed in secondary care. The majority of recommendations were not met. The reasons for a lack of adherence to the guidelines are not clear and are likely to be multifactorial: lack of knowledge of current guidelines; lack of evidence base to support recommendations; patients with coexisting asthma, COPD or other comorbidities; patients established on therapy; patient and healthcare professional issues; resource issues in primary and secondary care; accessibility to specialist healthcare professionals. Issues raised from the national audits along with new evidence will be used to formulate future guidelines. In addition, quality standards for bronchiectasis are to be published by the BTS in 2012, with the aim of improving care for patients with bronchiectasis. The BTS has also produced a template self-management plan for patients with bronchiectasis which may be adapted for local use (available at http://www.brit-thoracic.org.uk/guidelines/bronchiectasis-guideline-(non-cf).aspx). Results from future cycles of the BTS bronchiectasis audit will allow the impact of the introduction of quality standards to be monitored. ; British Thoracic Society Non-CF Bronchiectasis Guideline Group. British Thoracic Society guideline for non-CF bronchiectasis. Thorax 2010;65 Suppl 1:i1–58.